The ideal all-in-one metal set that builds 25 different motorized models! A deluxe set with motor and storage case. 6V battery-operated motor. Detailed assembly instructions for 15 models and 10 suggestions. Tools included. One model can be built at a time. Contains 643 parts. Batteries Required…. This toy costs approximately £59.99 (for the latest and best prices make sure you check our retailer list for the Meccano 25 Multimodels above). 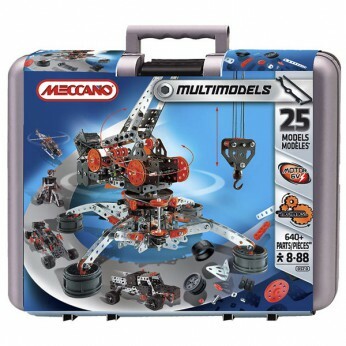 In our review of Meccano 25 Multimodels we classed it as being suitable for ages 9 years, over 10 years but recommend you check the manufacturer specific advice before purchasing.